Decongestant for lymph & veins. Great for respiratory infections. Virginia Cedarwood enhances any other esential oils that are used in a skin blend. It makes a great addition to any summer blends, as it has an insect-repellant action as well. As it is calming for the nervou system, and according to Battaglia, is more useful for chronic nervous conditions than acute ones. Juniperus virginiana is a dense, slowe growing coniferous tree from 15-90ft tall. It is a pioneer invader, which means that it is one of the first trees to repopulate cleared, eroded or otherwise damaged land. It is unusually long lived among pioneer species, with the potential to live over 850 years. Juniperus virginiana var virginiana is called Eastern Juniper or Red Cedar. The cones shed pollen in late winter or early spring. The trees are usually dioecious with pollen and seed cones on separate trees. Native American tribes used Juniper wood poles to mark out agreed tribal hunting territories. French traders named Baton Rouge (meaning "red stick") from the reddish color of these poles. 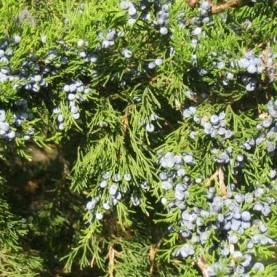 Berries of some cedars have been roasted as substitutes for coffee or tea. Western Indians believed that juniper berry tea taken on three consecutive and appropriate days was considered contraceptive. The Virginia Cedarwood tree is a majestic tree and imparts an energetic strength and fortitude. It is grounding and calming and helps us to feel more centered and balanced. This oil brings depth and meaning when we are feeling a bit lost or confused. When we use this oil, we feel the wisdom and clarity of the tree being infused into our energy. Virginia Cedarwood essential oil contains a significant percentage of a-cedrene that is known to be beneficial for the skin. The high percentage of cedrol in this oil is what gives it a sedative effect, because of its inhibition of dopamine. No known safety issues related to this oil. Some sources advise to avoid Cedarwood during pregnancy, however there is no research to support this claim regarding this particular species of Cedarwood.